Proxim Publishing | Noble Studios, Inc.
With distinctive titles such as “Growing Up in Long Beach” and “Haunted Carson City,” Arcadia Publishing and the History Press delight readers with books detailing the stories of small towns, ghost towns and other places that help weave the tapestry of America’s history. When Arcadia Publishing and The History Press recently merged, they explored using several different brand names, including Proxim Publishing. 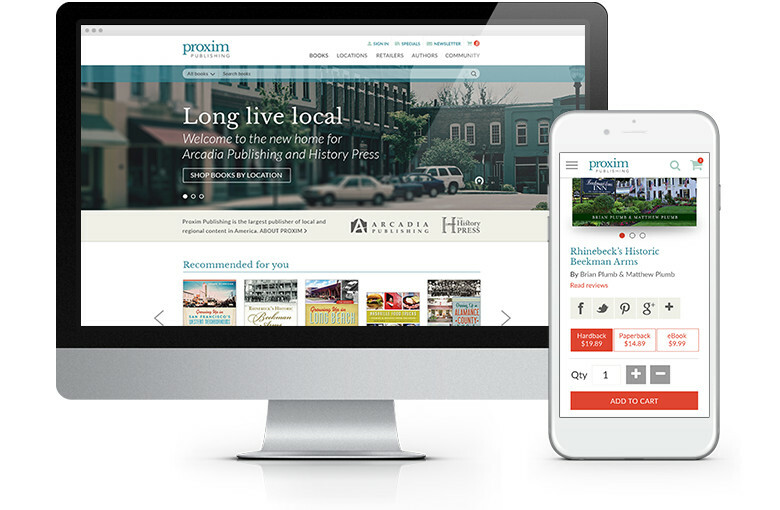 Noble Studios helped the publishers through this web design and branding exercise by designing a new eCommerce website and logo for Proxim. Noble’s approach was to give the new site a historical feel while still incorporating modern elements that would be intuitive to users. Vintage, but contemporary, in other words. Noble’s designers took both brands into consideration with the new design, incorporating elements of each for a seamless blending of the two in a sophisticated and clean look. Because Arcadia Publishing and The History Press produce books about history, we used historical imagery to create an instant emotional connection with visitors. With the design sorted out, Noble turned its attention to the eCommerce portion of the site. The first order of business was to improve the search function. With new functionality, the site allowed users to browse for books by subject, series, state or publisher. Listing pages could now be displayed alternately in a grid or a list format. And, as users are presented with results, they could further refine these results in order to find the perfect book. The site also detected a user’s location and made book recommendations for that geographic area. New tools allow readers to perform filtered searches by region or subject matter. Noble’s new design enhanced the eCommerce portion of the site, providing more book details. The mobile site employed gesture-based actions, which made for an easy, intuitive checkout process. The book detail pages feature greater details, including summaries, page counts, professional and reader reviews, author biographies and related books for sale. Social buttons allow shoppers to share their find with Twitter, Facebook, Pinterest and Google Plus friends. Once a shopper adds a book to their cart, they are presented with a message confirming their selection, allowing them to continue shopping without being taken to a cart page. Noble also added a “wish list” function, allowing people to save books for later. From moodboards and sketches to wireframes and UX design, the new site for Arcadia Publishing and The History Press resulted in an eCommerce website that went well beyond user expectation, providing them with an aesthetically pleasing experience that made selecting and purchasing books a breeze.